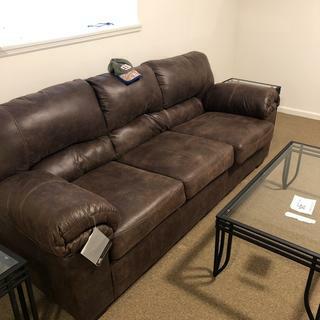 L: 90" x W: 36" x H: 38"
Livingston Leather-Look Sofa If you love the cool look of leather but long for the warm feel of fabric, you’ll find the Livingston leather-look sofa fits the bill beautifully. Rest assured, the textural, multi-tonal upholstery is rich with character and interest, while plush, pillowy cushions merge comfort and support with a high-style design. If you love the cool look of leather but long for the warm feel of fabric, you’ll find the Livingston leather-look sofa fits the bill beautifully. Rest assured, the textural, multi-tonal upholstery is rich with character and interest, while plush, pillowy cushions merge comfort and support with a high-style design. I am very pleased with this sofa. It is very comfortable yet firm. The color nicely fit into my decor, the material is soft. Looks like it will last a few years. Delivery was 3 days. The delivery team was very professional, called a day before to confirm the appointment. The driver called 20 minutes before arriving. Very happy. Ver nice quality. A bit on the firm side. And the material of the couch is more of a suade feel. Does not feel like leather. Looks like leather. Comfortable furniature too. Seems to hold well to my dogs. Love this sofa and loveseat. Very comfortable and the color is the right shade of brown. Holding up very well with 2 large dogs. my children love to seat on this sofa when they played games or watched television. I went to R&f outlet in Paramus looking to buy a recliner sofa, sat on everyone of them. All were good but not quite what i wanted, i than sat on this lovely couch and fell in love like a kid in high school. It was also quite a bit less than what i was willing to spend.. Now im considering buying the love seat, I recommend trying this couch out. I bought this couch because I was buying my new place and had to make a bunch of purchases. Cost was a major factor. I do like the couch for a number of reasons (firmness, soft material, nice look, my pup loves laying on the top of the back) but if you spend enough time sitting on the couch (especially as an adult) the seat cushions don't stay put and you CONSTANTLY have to fix them as they come out of place and slide forward quite a bit. I work from home and am at home a lot, so this is pretty annoying to me. Lots of good features and if you're getting it for a play room, for kids, or for every now and then lounging, cool. But if you're looking for something for your main space where you/your family will spend a lot of time in, I'd get a different one. I'm currently trying to get rid of mine after 10 months. This couch is the perfect combination of very affordable and expensive-looking. I highly recommend it for those who 1) want leather but don't want the price of leather or 2) like the look but not the feel of leather. It is a soft, smooth texture with plush cushions. So comfortable! I would buy it again and recommend it to anyone. I am very happy with the quick delivery. They arrived sooner that expected. The guys brought it inside my home. They were very polite and careful with the product. The sofa is firm and comfortable. I like the length and width of the seat. The sofa should be easy to care for. I am very pleased. I recommend this sofa, the price was within my budget. Unexpected value for a budget price. Purchased sofa online with help from a local store sales associate. Was very surprised at the quality of the product as the price was on the lower end of the furniture scale. Well made with heavy duty stitching, comfortable and sturdy. Holds up well with 4 cats, the fabric is easy to clean. Thumbs up! The couch we purchased is cozy and beautiful such a great price and a great purchase thank u Raymour and Flanignan your sale was professional. Absolutely love my couches and new bed. My sales person Rosemary was fantastic. The 2 gentleman that delivered were absolutely amazing! From start to finish, Raymour and Flanigan outlet was amazing. The purchasing in the store was seamless, nice salesperson who didn't hover, but answered questions. The store called me twice to verify address and the delivery team called 15 minutes before arrival. Set up was literally less than 10 minutes. The sofa is beautiful. Firm when compared to the floor model, but I am sure will soften. I have a dog, so I am curious on how the material will hold up. Home run as far as price goes. Great sofa. Its’s so comfortable! I like the size, it's very comfortable and fits perfectly in my living room. I also love the color. I really enjoy the look of this couch it looks like leather but with the softness of fabric. It is very comfortable and was super affordable. I recommend. I really like the material, excellent.Delivery on time, they called 15 minutes before the came to the apartment. Very comfy and looks great with my other pieces! Material us softer than I thought it would be. Firm seating and very comfortable! Great couch. Looks and feels like leather at a fraction of the price! Very comfortable and well worth the money! Will definitely be returning to buy the chair! Great set! Love it ! Great for my basement. We liked it online and love it in our family room! The sofa is super comfortable and gives support when sitting in it. The warm brown color makes the room cozy and inviting. Would definitely recommend-no better value for the price! When my family came home and saw this sofa their first response was “woahhh”! My youngest wanted to know if this was from a mansion! The sofa is ultra comfy. It looks so much like leather but doesn’t give that cold leather feel when you sit on it. It is very firm (not in a stiff way; when you sit you don’t sink into the sofa) and supportive. Definitely brings out the splendor in a room. The complete sofa set looks amazing in there living room. They are soft and comfortable. The color is a nice brown. My parents are loving it. I've had the couch for a week and my kids and I love it. It's comfortable and looks great in the room. Great quality affordable price ! Couch is beautiful. It's darker than expected but still looks great! Happy with my purchase. Nice color. A little stiff but not uncomfortable. Very happy with the couch for the price! Pretty excited about this comfy, economical sofa! Love the color, looks great with my décor. Sturdy and is holding up to 2 dogs, 2 cats and 3 kids! Will be purchasing the chair and ottoman to go with it soon :) Add a few soft pillows and it is a great place to sit and have a nap, thank you for a great product! Happy with my purchase and pricing was very good. It was very nice. It's the 1st thing I ever bought on line. Very pleased. It certainly won't be the last thing I buy. Thank you for giving me the experience of on line ordering. Just okay for the price. The soft wool in it sticks to y clothing. Will this fit through a door that is 31 inches? BEST ANSWER: A door width of 32" is recommended however it should not be a problem fitting this through a 31" door width! The width shown here is 38 inch so I am puzzled - how would it fit 32 inch door??? Is this item in the store? BEST ANSWER: The Livingston Leather-Look Sofa is an Outlet piece and is displayed at our Raymour & Flanigan's Outlet Centers. Is this sofa 100% leather? Is there another color with this sofa? BEST ANSWER: The Livingston Leather-Look Sofa is only available in Brown, as shown on the website. Is the back detachable to make it easy to fit in a 31 in opening? Would this sofa clear a 32” front door? BEST ANSWER: Yes. A door width of 32" is recommended for the Livingston Leather-Look Sofa. for spills, does it seep into the foam? BEST ANSWER: So it’s definitely not waterproof, but I would say if you wipe it up relatively quickly it won’t seep thru. I’ve had a couple spills and wiped them up, and there are no stains and no compromising of the foam structure. Also as a side note, these couches are the best furniture purchase ever. They were super cheap but are sooo comfortable. I’ve had mine 2 years and they are holding up great. The only negative is the feet that come with it are cheap plastic so I did buy wooden feet to screw in from Home Depot and that really made them look a lot more expensive. No I haven’t had any issues w that much liquid spilling! It’s a great couch, easy to clean and does not leave watermarks when I have had to clean it! BEST ANSWER: Hello Amanda! For assistance with product delivery questions, our online associates would be happy to answer and make suggestions. Please contact 866.383.4484, option 2! Well I have to let u know that the room (family room) that we have it in has double-doors so measurements wer’ent a consideration. The seat (bottom) cushions are removable which may give u the wiggle-room u need. Love it & hope this may help! Will this fit through a 29” door? BEST ANSWER: We have a standard front door and there was no problems. do the legs come off ? BEST ANSWER: The Livingston Leather-Look Sofa feet are not removable. Will this fit through a 32inch door? Especially, as the width is 38 inch and it's not even detachable. BEST ANSWER: The Livingston Leather-Look Sofa has a recommend door width of 32" even though the feet are not removable. Can you take away old sofa? BEST ANSWER: Hi Rachael, thank you for your interest in the Livingston Sofa, Unfortunately, we will only remove old mattress and box springs with the purchase of a new mattress and box spring set. For other furniture removal, we suggest contacting a local charity or Rescue Mission. BEST ANSWER: The Livingston Leather-Look Sofa is not offered in black. Where is the nearest store to 11385? BEST ANSWER: If you go to our website and select "Find A Store", you are able to search your zip code to find your nearest stores. What is the length arm to arm? BEST ANSWER: The dimension from arm to arm is 65". Are the seat cushions attached? BEST ANSWER: The seat cushions on the Livingston Leather-Look Sofa are not attached. If this furniture gets wet say from a pet licking..will it stain or is it easy to clean? Concerned about dog hair. Will it "slide off" the couch (like real leather) or stick to the couch and have to be removed manually? BEST ANSWER: The Livingston Leather-Look Sofa is made with a 95% polyester, 5% polyurethane upholstery fabric. Pet hair will not actually slide off, but will typically sit on top of the fabric and can easily be vacuumed. Is the entire back of the couch covered in the same material as you see on the front of the couch? Or is it covered in a different type of material/blend of materials? I might be placing it with its back exposed and don't want it to have a different color exposed to the viewing eye? BEST ANSWER: The back of the Livingston Sofa is covered in the same upholstery as the front. Is the surface nonpermeable and wipeable, like leather, or is it absorbent, like a fabric sofa? I can't tell for sure by looking at it. BEST ANSWER: The upholstery is 95% Polyester/5% polyurethane and is absorbent. Will it stand up to pets?